Adventure is not only for young people, but it is for all people having a spirit of adventure in their hearts. This time a middle-aged name Mario wants to look for adventure in Mario Craft, and you can guess what you will do at this game. You will assist Mario in exploring, seeking, and crafting interesting things from raw materials. Let help us write more about the features of the game or share with us what you can examine after playing. There is a message from Mario Craft that is never too old to chase your dream. You use the mouse to play Mario Craft. You move blocks by clicking into and drag it to the place you want to place it. Before you want to break a block, you need a sword. Holding the sword and pressing Space helps you break the block. Crafting in Mario Craft is different from in other Minecraft games. 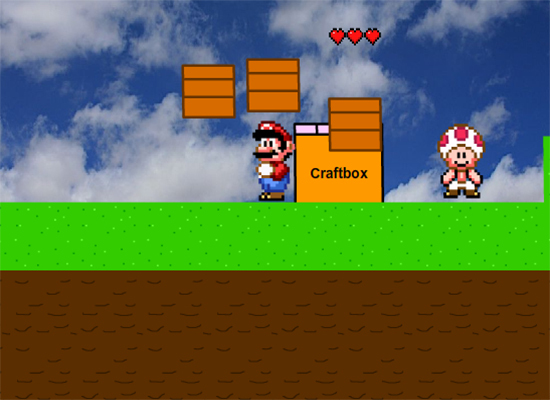 First, you take a block to the Crafting Box, and then let Mario hit the Crafting Box. The block will be changed into another advanced block. Several blocks can be used to craft more than one thing; these blocks have two colors consisting of green and red.